A bone spur, or osteophyte, is a projection of bone that develops and grows along the edge of joints. Bone spurs are fairly common in people over the age of 60. It is not the bone spur itself that is the real problem; pain and inflammation begin to occur when the bone spur rubs against nerves and bones. As we age, the discs in our spine naturally degenerate and lose some of their natural shock-absorbing ability. Factors that contribute to and accelerate this process include stress, injury, poor posture, poor nutrition, and family history. It is not uncommon for people with osteoarthritis to get bone spurs. Osteoarthritis is a degenerative condition in which joint cartilage begins to wear down, causing bone to rub against bone. 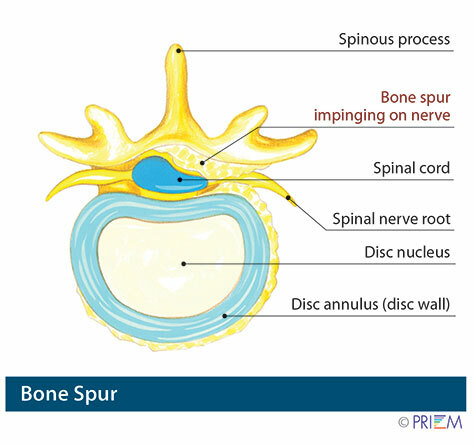 As a result, the body may begin to produce new bone to protect against this, which is how a bone spur forms. Electrodiagnostics: Electrical testing of the nerves and spinal cord may be performed as part of a diagnostic workup. These tests, called electromyography (EMG) or somato sensory evoked potentials (SSEP), assist your doctor in understanding how your nerves or spinal cord are affected by your condition. Discography is used to determine the internal structure of a disc. It is performed by using a local anesthetic and injecting a dye into the disc under X-ray guidance. An X-ray and CT scan are performed to view the disc composition to determine if its structure is normal or abnormal. In addition to the disc appearance, your doctor will note any pain associated with this injection. The benefit of a discogram is that it enables the physician to confirm the disc level that is causing your pain. This ensures that surgery will be more successful and reduces the risk of operating on the wrong disc. Injections: Pain-relieving injections can relieve back pain and give the physician important information about your problem, as well as provide a bridge therapy. The goal when treating bone spurs is to minimize pain and prevent any additional joint damage. Treatment methods may include weight loss, stretching and physical therapy, rest and ice. Injections can reduce inflammation long enough to relieve symptoms. Medications such as ibuprofen or injections may be administered for pain. Bone spurs can be surgically removed in the case of serious damage and deformity. How can osteoporosis impact the spine and cause a bone spur? Osteoporosis can have extremely serious consequences on the spine. It is a degenerative condition in which joint cartilage can begin to wear down, causing bone to rub against bone. As a result, the body may begin to produce new bone to protect against this, which is how a bone spur forms. How can I tell if I have a bone spur? Bone spurs can generally be detected through X-ray, which can provide a visual of any bony deposits. Do I need surgery to treat a bone spur? Because bone spurs are usually evidence of an underlying problem, this main problem should be addressed first. This can include treatment methods for degenerative disc disease, arthritis and osteoporosis. These conditions can often be successfully treated with nonsurgical methods.